- How can I send troops to another player? There are two options at your disposal: you can either send support (in which case you retain control over and "ownership" of your troops), or transfer troops (which is the same as troop donation or troop gift). - How can I support another player? Once the troop makes it to the city, it will automatically find shelter in your friend's Tambo and stay in position for battle until it's recalled or sent back. - How can I recall my troops? 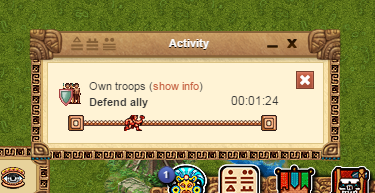 Go to the tambo building, click on "my troops" tab and press the recall button: by doing so, your troops stationed at other players' tambos will return home. - What are the requirements for sending support via tambo? - the recipient must have sufficient place in their tambo building. - What is the difference between support and troop transfer? 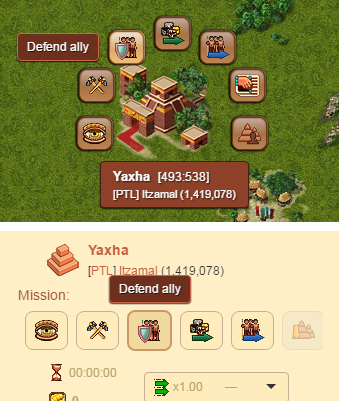 - you can recall your troops any time by pressing the recall button in your tambo building. When transferring troops to another player, you practically donate the troops, which is equivalent to troop gifts. By doing so, you lose control over trasferred troops, they cease to be yours, and you can only get them back if the other player agrees to send them back. Also, by transferring troops you transfer the "ownership" to another player, which will be taken into account in terms of scores: your score would go down for the amount of points that the troop you transfer is worth, while the score of the recipient would go up exactly for the same amount of points. - What happens to my troops if I transfer them to another player? You would donate troops to that player, in other words, make him/her a gift. - I've sent (transferred) troops to another player, how do I get them back? If you transfer troops to another player, you can only get the troops back if that player returns them to you. - When does it make sense to use the troop transfer option? Troop transfer is very useful for sending troops between own cities. It can also be used for sending troops to other players, for example, if your friend loses troops in a battle and you wish to help him/her out. Note that if you transfer troops to another player, you will only be able to get them back if that other player returns them to you. For this reason, it is recommended using this option only if you have clarified with the other player how you get your troops back. Otherwise you would very likely never see them again. - How can I transfer troops to another player? A click on the "Transfer troops" button will open up a window with an overview of all troops stationed in the city. Select the units you wish to transfer, and press the "Send troops" button. Hint: if you need to transfer troops to another player only for "Transfer troops" quest, it would be enough if you send just one unit (e.g. one holcan lancer). - What are the requirements for transferring troops to another player? A Jaguar Temple level 5 in both cities - of the recipient and of the sender. You need to have enough corn in your city, in order to pay for the mission. The rates (in corn) for each unit are displayed in the Jaguar Temple. the recipient must be able to recruit these units by themselves. 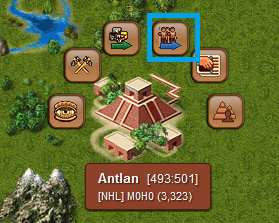 For example, if you want to transfer jaguar warriors to another player, they must be able to recruit this unit on their own, at least in one of their cities. Otherwise, the units cannot be transferred. Will the followwing be implemented with the update - to the batte mechanics?